Long before the start of the cold season, Jack Sage (JES) from Montana and I listened to news reports of how heating costs this coming winter would be sky high. Paying last winter’s heat bill was tough enough, so knowing we’d have even higher heat bills this winter was, to say the least, scary. We both agreed to do something about it. 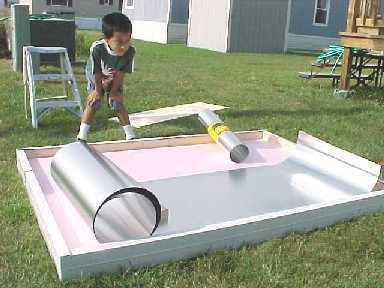 So throughout the summer Jack and I explored various options for creating “cheap heat.” The most sensible solution we found was to heat the air in our home using a solar heating panel. Yep, we decided to let the sun help heat our home. When you think “solar”, you may first think about those expensive panels designed to create electricity. We are talking about a completely different solar panel. Our solar heating panel is designed to heat air, not create electricity. Other designs include a heating liquid. To heat, air is drawn into the bottom of the panel. The air zigzags through the panel and comes out of the top 10-50 degrees warmer on sunny days. Air moves through the panel either by convection or by a fan located at the top. Sounds like a simple concept, but do one thing wrong and you’ll get less than desirable results. As we share with you how we built our solar heating panel, we’ll introduce you to various options and ideas. Soon you’ll begin to formulate how your solar panel may look or operate. For a solar heating panel to operate effectively, you must keep in mind the following Rules of Thumb. Depending upon what works best in your case, you can build the solar heating panels in two ways — to work inside your home or outside your home. Heaters that work outside your home can be fastened to your roof or the south side of your home. Heaters that work inside your home will hang in a south-facing window. Generally, outside heaters will create hotter temperatures and will be bigger than the inside heaters. 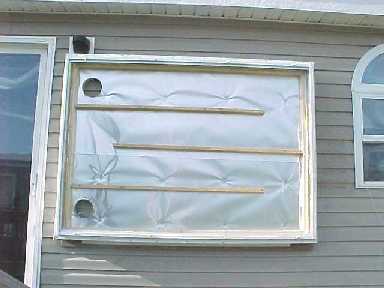 Outside heaters will have double-pained glass and insulated on all sides. Inside heaters may have single-pained glass and no insulation except for some in the back. 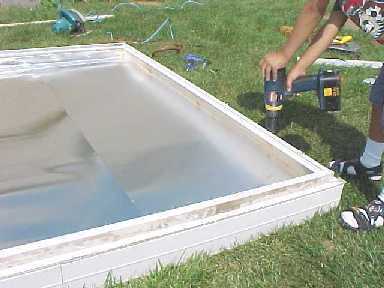 For the purposes of this article, we will show you how to build the outside solar heating panel. Glass (or Plexiglas) is the most expensive piece of our solar heating panel. So we look for discarded windows to help cut costs. 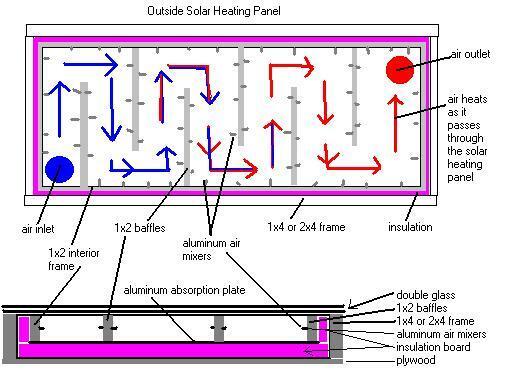 The double-insulated glass is a must for outside solar heaters. 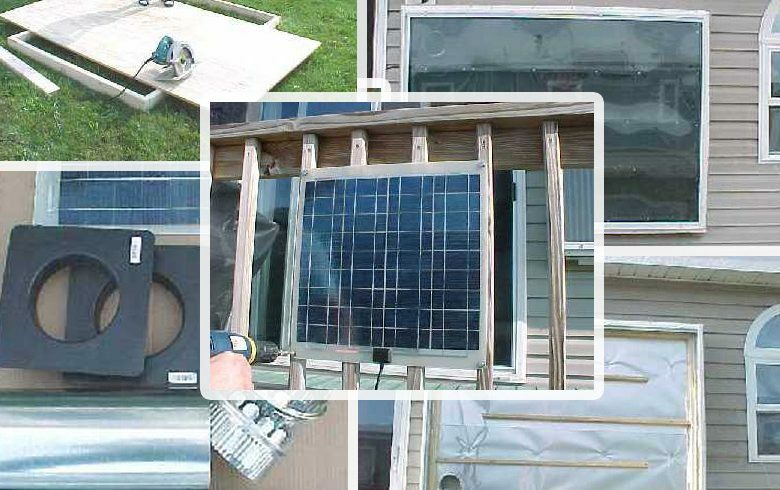 For the solar panel shown in this article, we found an old double-pained window that measured approximately 4’x5′. 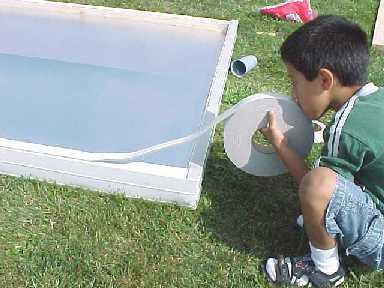 If you are building an inside solar heater, then use Plexiglas so you can build the unit to the size of the window it’ll be hung next too. 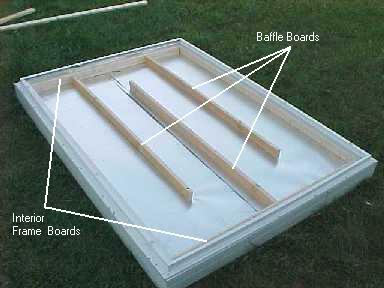 Using 1×4′ or 2×4’s, build a frame that will fit the glass you found. Nail a piece of 1/2″ plywood to the back of the frame. Since this solar heating panel would become a permanent fixture on the side of my house, I covered the frame with a metal that matched the trim on the house. Line the back of the panel with 1.5″ insulation board. 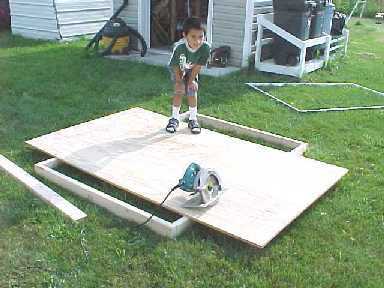 The insulation board comes in 4’x8′ sheets and is easily found at most home improvement stores. Cut to fit using a utility knife. Simply set in place. No glue or fasteners needed. Aluminum flashing is used as the heat absorption plate. Aluminum flashing is inexpensive and readily available. If you don’t use aluminum, you want something that will conduct heat well, like copper perhaps. The best absorption plates are those with selective surfaces, such as surfaces plated with nickel, then covered by black chrome. They conduct heat superbly with hardly any long-wave emissivity (reflection). But they are also very expensive, so we aren’t using them here. 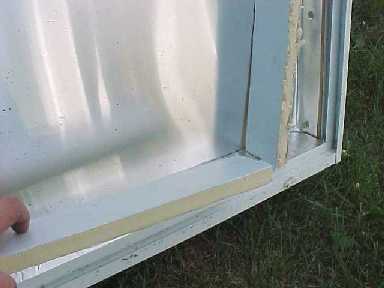 The aluminum flashing is available in many width and lengths. For this project, I used flashing that was 30″ wide and 10′ long. Cut to fit, overlapping in the middle is OK. No need to glue or fasten. The window I found came with a removable frame. So at this time, I decided to screw the frame to the panel. 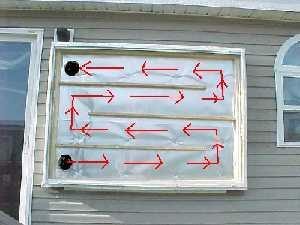 If your window must be permanently screwed to the panel, wait and do that as the very last step. Keeping everything sealed is important for an efficient working panel. Before I screwed the window frame to the panel, my son put down a layer of weather-stripping. Set the window frame on the weather-stripping and screw into place. 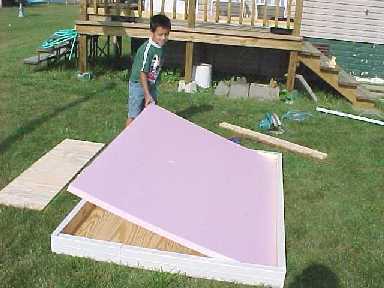 Add strips of insulation board to the sides of the panel. On this panel, I used 3/4″ insulation board. Add the interior frame boards and baffles. Everything is held in place using these boards. When the glass is added, these boards must seal to the top of the glass. That will make them approximately 2″ tall. Double check all measurements. Screw the interior frame boards directly to the side of the panel. Keep everything at the same height. If you haven’t determined the size of your pathways ( the doesn’tarea between the baffle boards), you need to do that now. Read these Rules of Thumb for help. In our panel, we determined we needed pathways with equal 20 square inches. Our pathways are approximately 10″ wide by 2″ high. The baffle boards are screwed in place by first drilling several holes down through the baffles. Apply weather-stripping to the bottom of the baffle boards. 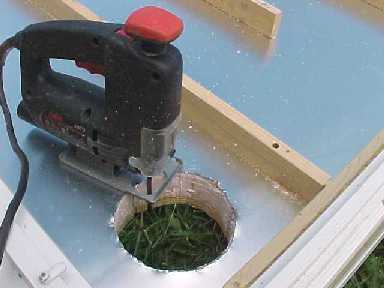 Then a 4″ screw is driven down the baffles, through the 1.5″ of insulation board, then into the plywood at the bottom. Next step is to cut in the air openings. Normally you would have one opening in the lower left and the other in the upper right (or vice versa). But in our case, we had to put the openings on the same side so they wouldn’t interfere with some cabinets on the wall. The opening size should closely match the pathway size. In our case, we used a 5″ opening as it’s area was about 20 square inches. Again, read these Rules of Thumb for more information. I used a jigsaw to cut my openings. Whether you hang your panel on the wall or on the roof, you must first do some preplanning. Figure out where the wall studs or roof rafters are. Your panel will be fastened to these studs or rafters. Plus, your panel needs to be lined up so the air intake and outlet do not hit a stud or rafter. In our example, we mounted the panel flat to a south wall. If you wish that the panel be pointed slightly up towards the sun, that needs to be taken into consideration now. Once we figured out exactly where the panel would be located, we screwed a board to the house which would help hold up and support the panel as we screwed it in place. 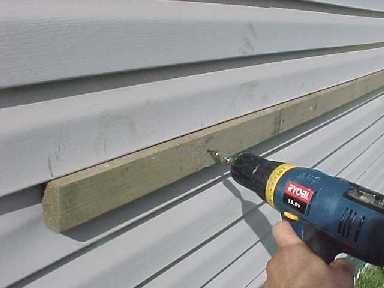 We then screwed the panel to the side of the house using 3.5″ screwed with washers. Of course the screws went into the stud of the wall.